I thought the tower of the St. Paul Church reminded me of the game Dark Tower (1981). I'm inclined to think this is the Fortress mentioned in the first line of the verse. 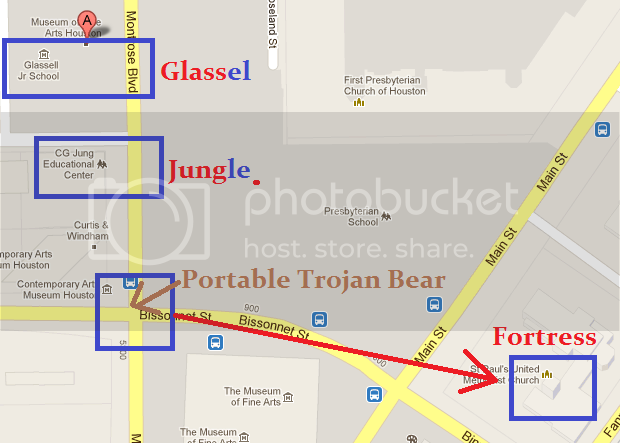 I wonder if the "Through the wood" line is sufficient as a reference to the Portable Trojan Bear. The word 'through' has many interesting usages. It can even be a term for a large slab of stone lain over a tomb. A large slab of stone laid on a tomb. But that gets away from my point unless someone has a stone slab in mind. The Portable Trojan Bear is a mostly wood and iron art sculpture. Recalling the story about the Trojan Horse, it was a wooden construct used to gain entry through the gates and then the soldiers contained in its hollow form emerged through a secret hatch. Through the wood. I feel that these three simple words might be a most economical way of saying "Hey, look for that Trojan Bear sculpture: corner of Montrose and Bissonet." These lines are presented as introduction. I think the Fortress is the towering section of the St. Paul church on Bissonet as seen from the corner of Montrose near the Glassel Art School. We are then considering something south. This sets our goal to head to the iconic locomotive steam engine, requiring us to travel south through the north entrance area of Hermann Park. Beginning our trek south from the Glassel Art School, we pass the Jung Center of Houston (Hey, there's one of those where I live in Eugene, ORE. too). The main point of the ambiguous line "Through the wood" is followed by "No lion fears" seems to be a relatively simple assertion that a "Jungle" is the wood a lion as king of the jungle wouldn't fear. Is it sufficient to reason that "Jungle" = Jung institute? I wonder if the focus here is seeing the sky's reflection in the large rectangular pool that follows Hermann Circle. I have little doubt this is the miniature train track you first encounter as you pass the Pioneer monument. 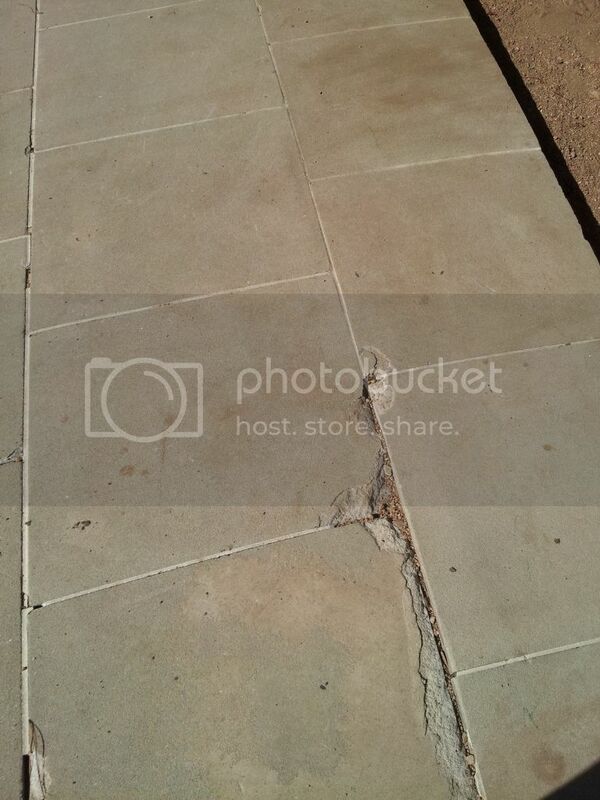 Using the image, you should see that you have found the exact spot intended. I've used the Golden Spiral to show that it resolves to a point just near the base of the large column with the ball on top. 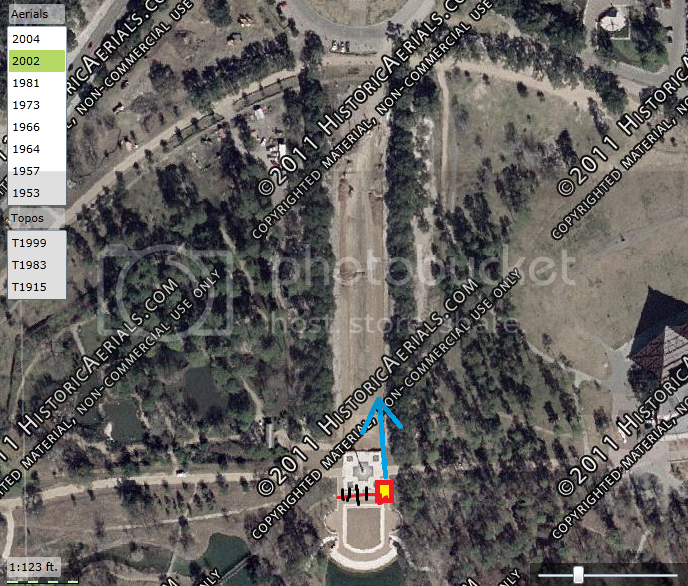 Taking a map or aerial perspective, that puts us right around the spot off the southeast corner of the Pioneer monument. 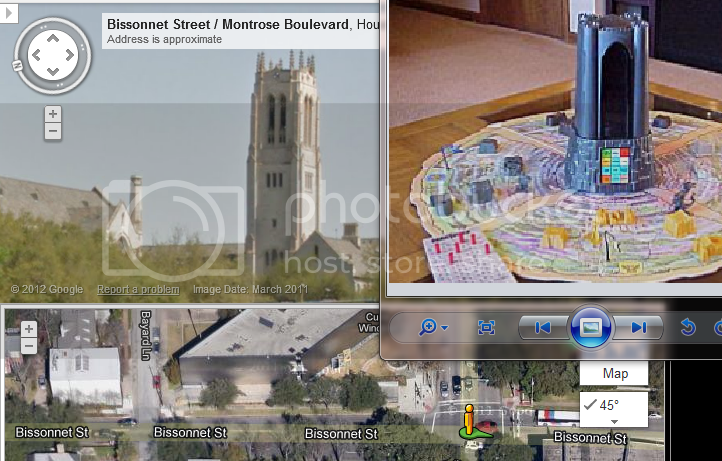 Holding the image up and looking north you'll see that the Sam Houston statue fits the position of the camel on column in the image except he (Sam) is facing to the right whereas the camel is facing left. This is a curious situation. We've just traveled south and not necessarily made our trek all the way to the 982 and we have a possible match to the image but in the perspective the heads are facing left. We can, however, find a perspective that fits Sam to the camel if we double back. Sam Houston statue in the center of a circle has(had) four trees in a square around him. 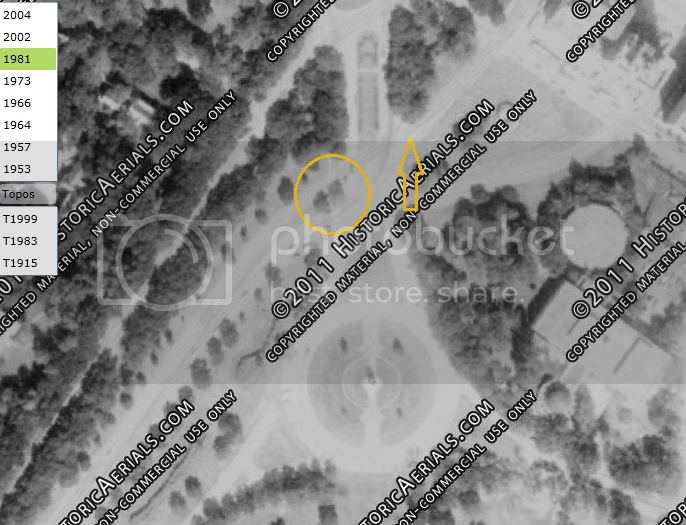 Hermann Circle has three main offshoots (three winged?). Passing through and to the north side of the statue we find he again fits the perspective when we look back south from a small area where Fannin splits into San Jacinto. This cries snowflake to me, but it could be something else. Falling gently to sleep? In December night use a heater and a light? Further confirmation that we are in the right spot if we see a spout of some sort. I say it's the Mecom Fountain. Don't really know what the whistle could be unless its an intersection, like how a Police officer would direct traffic. I'm almost ready to toss out all the crap ideas I've come up with recently about helmets, battlestar galactica, blimps, etc. It's all a byproduct of brainstorming. This captured my attention however. 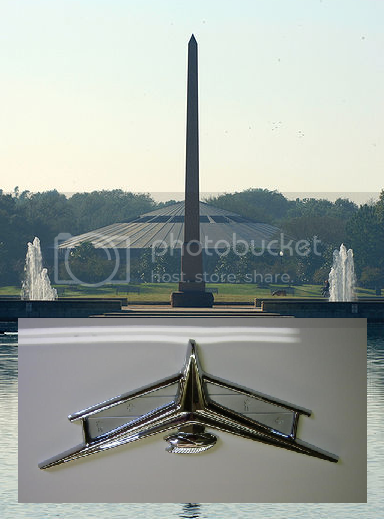 It's a centered view of the Pioneer Memorial and the Pavillion compared to an inverted Buick trunk logo. Pardon my misspell of the word pavilion. I had it stuck in my head as having two-L's. Anyhow, I wonder if the verse points to a Pavilion with the use of the words friendship and lion. The large circular structure is one of the most prominent features of the park. I don't know that my "buick" hypothesis is strong enough to support this inverted logo comparison but I do like the Buck Rogers idea as it links to an idea of falling asleep in December and traveling through time and space (locomotion). Inserting the letter-I in the word Buck to make Buick seems foolish, but taking the HWY-59 proximity to the Glassel Art School as a Buick Logo correlation isn't too hard to swallow. Unfortunately, nothing in the image supports this idea, and nothing in the verse is especially direct for this conclusion. Let's take a closer look. Excuse the large image uploads, going for the best detail I could find available. Comparing 1981 with 2002 aerials, I didn't think there was a rail system installed prior to 1984, yet looking closely you can make out the rails on Fannin (see yellow arrow). 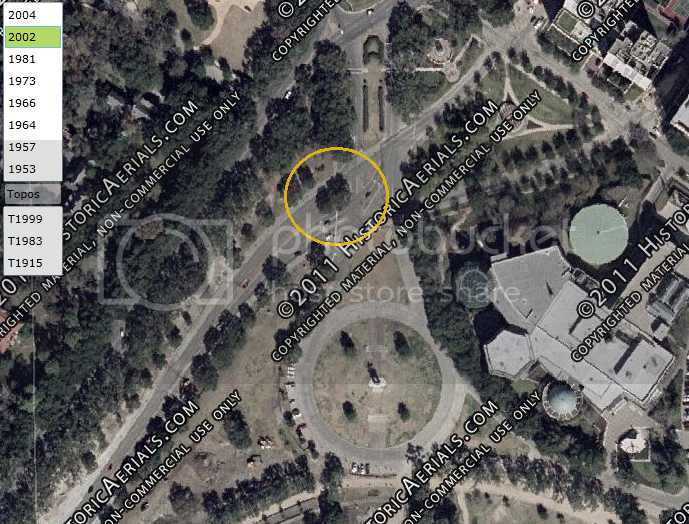 There are just TWO trees on what I call the "Fannin Split" in 1981, still in place in 2002 (see yellow circle). As for the large reflecting pool, it's obviously under construction in 2002 and has been done several times over past decades of improvements. The Pioneer Memorial looks like it was relocated south about 50-60 feet. The mini-rail tracks seem to have been moved north by the same margin. 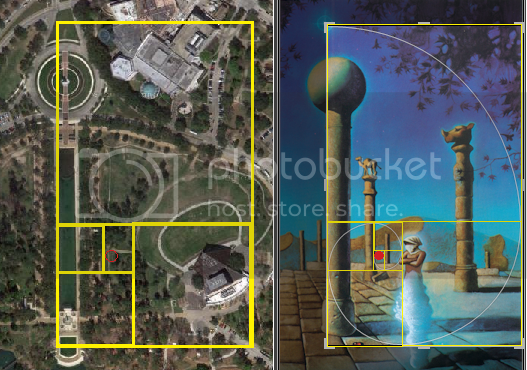 Neither change affects my interpretation much since this is just the location where the Golden Spiral resolves and is only a very rough indicator of where to stand in order to find a perspective which might resemble something in the image. Surely you've passed on most of my more imaginative correlations (blimps, BSG, etc..) but how about that Jung School idea? I'm really enthusiastic about that more down to earth idea. See how several very good connections are within grasp from the vicinity of Montrose and Bissonet. A new spot, a small 50 foot radius, somewhere between the Pioneer Memorial and the Miller Outdoor Theater looks VERY interesting. I've taken a new approach on the Golden Spiral that makes a simplifying assumption look less dubious. Unfortunately google view hasn't strolled off the beaten path enough. Sadly, I've given up on all of my fun associations in favor of a discrete rectangle. I may have come through on this one. To explain, some things that bothered me a lot in terms of a map overlay is 1) the previous two solves didn't really use the method and 2) the star and the red stone in the image didn't seem to be good indicators of real world markers (i.e. it required forcing to make any sense). The Golden Spiral idea seems to really fit this image but the choice of where to place this 1.0000:1.1618 ratio rectangle seemed arbitrary. Going with the entire border is sufficient for this exercise, but it is also possible that the star and red stone are line intersecting points, thus I easily placed the rectangle in a non-arbitrary way to meet this condition and it seems to indicate a point of interest marked by the red dot. 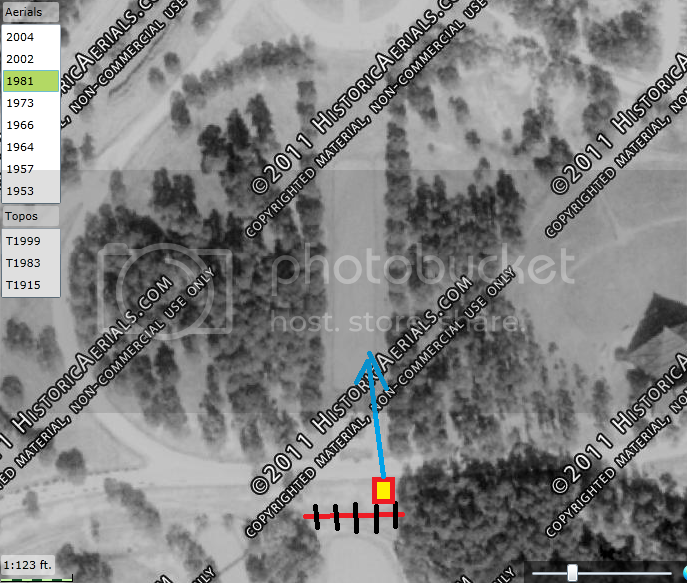 Some minor eyeballing adjustments were needed to resize the aerial, but the proportions look pretty close, which is all that's needed for a person to pinpoint a smallish area for a closer inspection of the grounds for any kind of further indicator. Looking for a "Whistle" clue or a "Spout" seems like a good place to start. Not sure if they are new or not but felt I should list them. 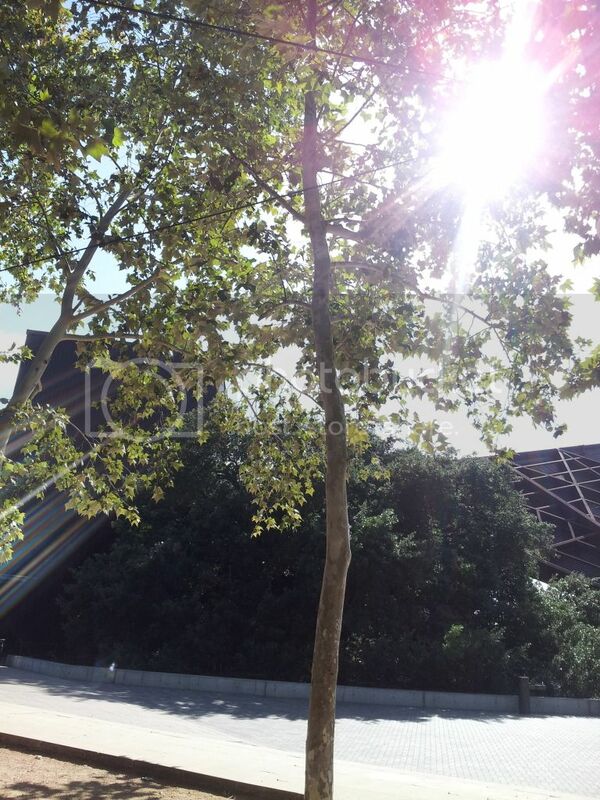 I want to note that there are tons of trees at the park and most of them look the same with the exception of this type of tree near the theater. Near the theater I found only one area where this tree was planted. I hope to be armed with a ground penetrating radar next time I go as I think that getting permission to dig will be rather hard. rookhunter, can you give us the exact location of that tilted stone and is there anyway of knowing if it was in place there or elsewhere in the park in 1981? I wish GPR were cheap and easy but it just aint. I may or may not be dropping 5 Franklins on a GPR project in the Northwest because I'm still too chickenshit to risk getting cuffed like the guy I saw getting cuffed when I went to go dig. I had an interpretation for the Genie as it's arms crossed expression of waiting indicates being stationary, however the swirling funnel beneath the torso would indicate constant motion. Comparing this with the etymology of 'locomotion' which basically combines 'locus' and 'motivus' meaning 'motion in place'. This isn't to say the Genie represents the 982 Locomotive. Trains are allowed to move along a track through reciprocating wheel travel. In the case of a steam locomotive, the action of a piston applied to a wheel gives it forward or reverse motion. This piston operates as a long shaft inside a barrel attached to a point on a wheel. Perhaps the tall column with the ball on the end establishes a symbolic representation of this train feature. Without getting complicated as I often do, I'm going to try to consider if this idea has any direct implication as presented by image8. Is the "task" we take suppose to be the path we follow to include a full travel from point A to point B but then returning in the direction of point A some arbitrary distance similar to a stationary point on a train's piston arm? Starting at a place north (Glassel Art School) and then going south to the 982 and then back north somewhere in between would fit this perspective.